ASHEVILLE, NC — Tellico independently releases their debut album Relics and Roses on June 2, 2015. The album features the singing and songwriting of Anya Hinkle (guitar, fiddle) and Stig Stiglets (bass), and showcases Aaron Ballance on dobro and pedal and lap steel and Jed Willis on mandolin and clawhammer banjo. Guitar virtuoso Jon Stickley (Jon Stickley Trio) produced the album and makes a few guest appearances with drums and guitar. The album is available now for pre-order at Tellicoband.com and includes an immediate download of the leading track, “Backstep Blues,” which is also available to stream now at the band’s website. Firmly planted in Asheville NC’s thriving roots music scene, Tellico is well schooled in bluegrass but with an unbridled organic “Appalachiacana” sound, combining some of the finest voices, songs and instrumental prowess in western North Carolina and beyond. Anya and Stig’s committed, authentic vocals are alloyed with Aaron’s flowing and soaring dobro and Jed’s textured and expressive mandolin, rooted in the mountain music they grew up with while pushing tradition into a modern Americana sound aesthetic. Storytelling is at the helm of Tellico’s music. All of the songs on Relics and Roses were penned by Hinkle and Stiglets with the exception “White Line-River of Pride,” a Neil Young and Crazy Horse medley of two dirty electric rock tunes buttoned up bluegrass-style. The leading track, “Backstep Blues” [Hinkle] has a “backstep”, a rhythmic hiccup that is typical of old time music, telling the story of a man’s successive retreat from his wife (with the refrain “hey where did your daddy go wrong?”), leaving her with the “backstep blues.” “Calamity”, written by Stiglets, is a tale of disaster sparked by a combination of Hurricane Katrina and Japan’s 2011 tsunami, and the destructive and terrifying images of those events. 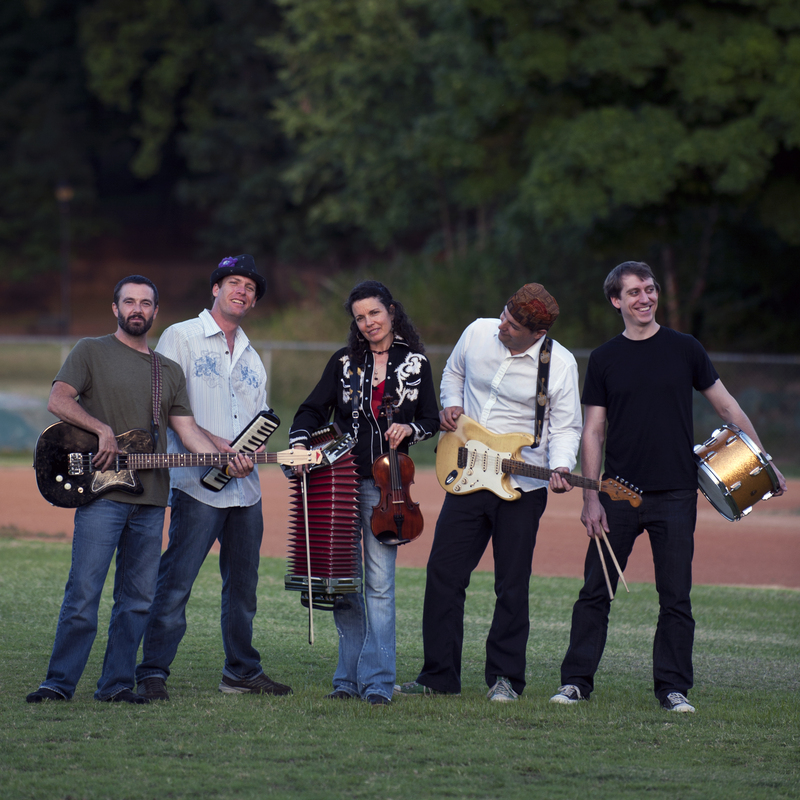 Relics and Roses is the first since Anya, Stig, and Aaron formed Tellico after recording four records with the Asheville-based bluegrass band Dehlia Low, whose final album Ravens and Crows was released on the Rebel Records label in 2011. “I love how the songs on Relics and Roses sound with these musicians covering all details that I didn’t even realize I was longing to hear. The band’s rich playing overlays absolutely perfectly with the meanings of the songs, whether playful and amusing or searching, haunting and lonely,” says Hinkle. Find out more about Tellico and Relics and Roses at at Tellicoband.com, facebook.com/Tellico & twitter.com/TellicoBand. Donna the Buffalo, The Honeycutters, and Savannah Smith at MerleFest This Weekend! We’re so excited about MerleFest this year! Donna the Buffalo, The Honeycutters, and Savannah Smith. All three acts are available for onsite interviews, pending timing. We hope you are able to catch their sets! Times and stages, as well as a bit more about each are posted below. Cheers & see you at the fest! Donna the Buffalo just passed the marker as their 25th year as a band and have proven to be a consistent purveyor of American music. What’s the recipe? To be sure, it’s infused with more spices than you’ll find at a Cajun cookout by way of a southern-fried, rockin’ country old-time jamboree. “For the dizzying array of styles and genres with which they work, Donna The Buffalo maintain a surprising level of consistency. The New York-based band has played around with folk, zydeco, and many other musical ideas over the course of their 25-year career, but they retain a sharp focus that has helped them create some truly lasting music,” writes Elmore Magazine. 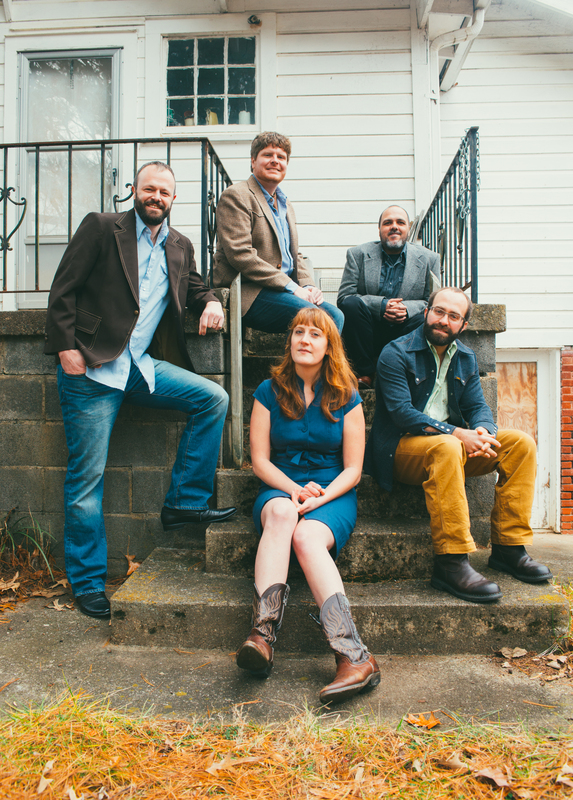 The Honeycutters, an Asheville, NC-based original country roots band, is set to release their third studio album, Me Oh My, on April 21, 2015 with Organic Records®. Fueled by the powerful songwriting and vocals of founder Amanda Platt, Me Oh My moves her into the spotlight as producer, band leader, and principal creative force behind the band. With songs that are honest and relatable, part chagrin and part hope, Platt’s voice carries a timeless appeal. Led by songwriter Amanda Anne Platt, The Honeycutters include Tal Taylor on mandolin, Rick Cooper on bass, Josh Milligan on drums, and Matt Smith rounds out the band on pedal steel, electric guitar, and dobro to create a sound that carries just as well across the bar room as in a church or a theater. Platt’s songs are shaped by a raw honesty that comes straight from the heart and emits a sort of melancholy happiness. Newcomer Savannah Smith, originally from Tupelo, brings North Mississippi soul to whatever stage she graces. 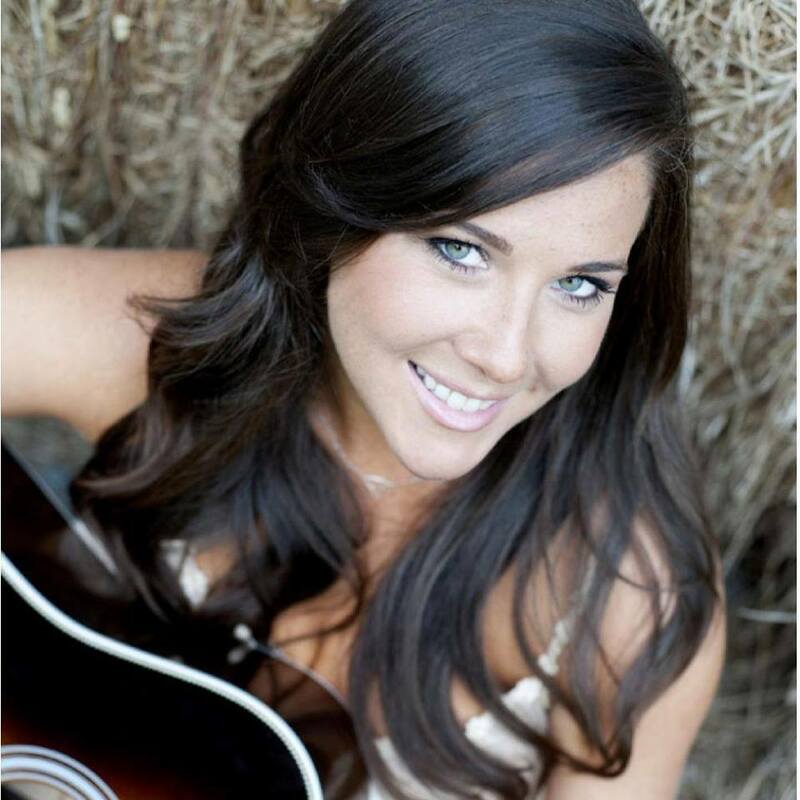 Her original songs and their heartfelt melodies evoke emotions usually associated with more seasoned writers. Savannah is poised and ready to be the next important female singer/songwriter to come from the talent rich region of Western North Carolina! Be on the lookout for Savannah’s new project, recorded at the prestigious Echo Mountain studios in Asheville, NC. You don’t wanna miss this talented young artist perform! 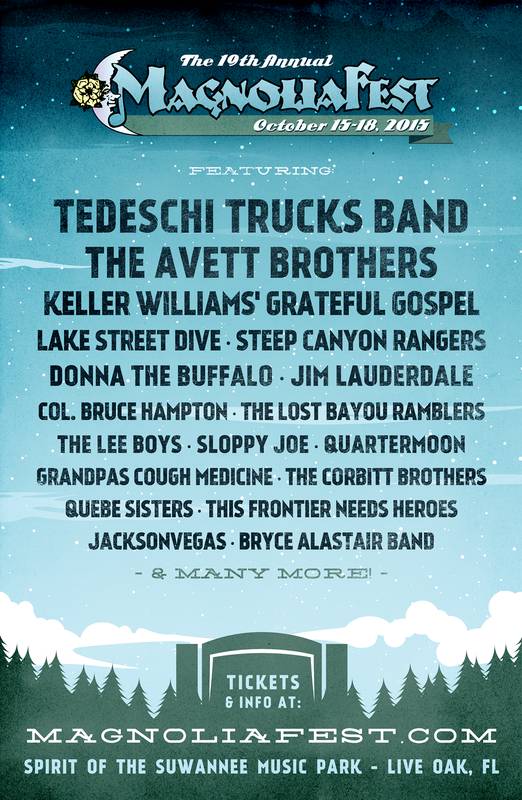 Tedeschi Trucks Band, The Avett Brothers, Lake Street Dive, Keller Williams Grateful Gospel, Steep Canyon Rangers, Donna the Buffalo, Jim Lauderdale, Col Bruce Hampton and more! Tickets are on sale now with early bird rates. Get your tickets early and save! Tickets for Magnolia Fest are on sale now in advance for $160 until the price increase to $175 on May 25th through July 19th; $185 until August 20th; $200 until October 14th; and $210 at gate. All weekend tickets are inclusive of all taxes and fees, and include 4 days of primitive camping and music. Kids under 12 are invited to join for free. Fans can also upgrade their experience with VIP tickets for $350 through 8/30 ($400 after that) which includes dinner, discounts, VIP Lounge, festival poster, & other perks. For RV hook ups, cabin rentals and golf cart rentals, please call SOSMP at (386)-364-1683. For further information and tickets, please visit www.MagnoliaFest.com. … and many more TBA! Asheville’s Tellico Debuts with Relics and Roses, Due Out June 2nd Announcing Shows at LEAF & Isis in Asheville this Spring! Explorative acoustic music that goes beyond conventional bluegrass, integrating with equal ease an old-time banjo-fiddle groove and an Americana aesthetic with drums and electric steel guitars. 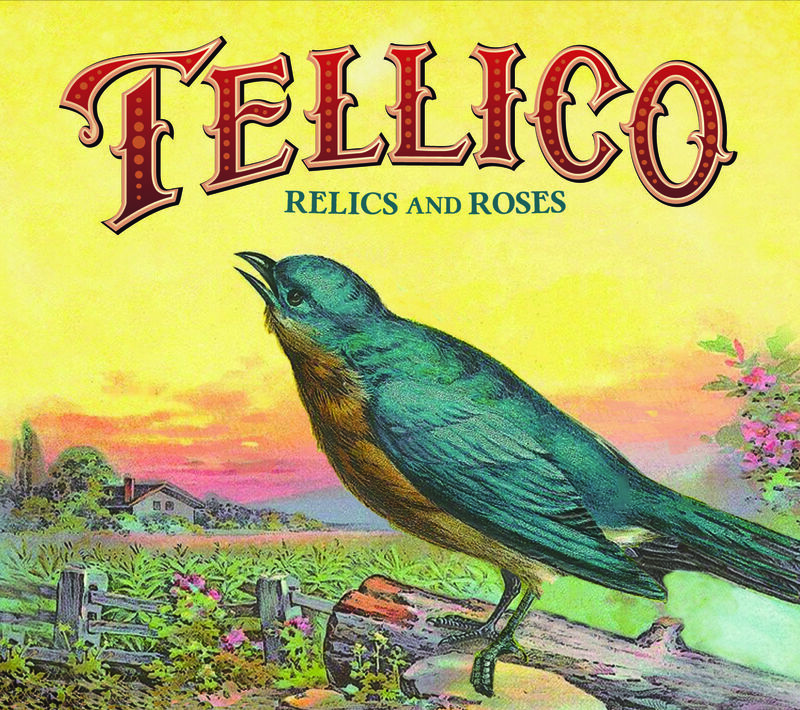 Tellico will independently release their debut album Relics and Roses on June 2, 2015. The album features the singing and songwriting of Anya Hinkle (guitar, fiddle) and Stig Stiglets (bass), and showcases Aaron Ballance on dobro and pedal and lap steel and Jed Willis on mandolin and clawhammer banjo. Guitar virtuoso Jon Stickley (Jon Stickley Trio) produced the album and makes a few guest appearances with drums and guitar. The album is available now for pre-order at Tellicoband.com and includes an immediate download of the leading track, “Backstep Blues.” Tellico is pleased to announce Asheville regional shows including a Friday evening set at LEAF Festival on May 8th and an album release celebration at Isis Music Hall on Friday, June 5th. Visit their website for the most updated show listings. Firmly planted in Asheville NC’s thriving roots music scene, Tellico is well schooled in bluegrass but with an unbridled organic “Appalachiacana” sound, combining some of the finest voices, songs and instrumental prowess in western North Carolina and beyond. Anya and Stig’s committed, authentic vocals are alloyed with Aaron’s flowing and soaring dobro and Jed’s textured and expressive mandolin, rooted in the mountain music they grew up with while pushing tradition into a modern Americana sound aesthetic. 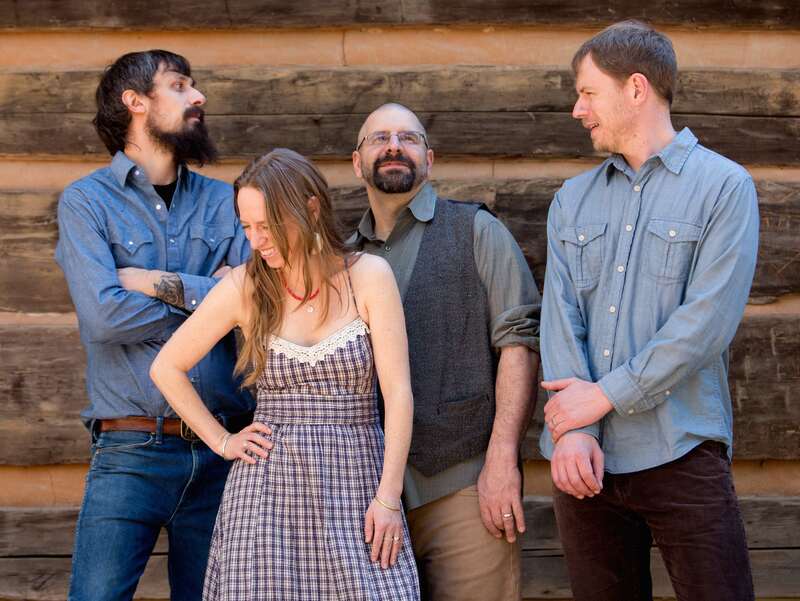 Relics and Roses is the first since Anya, Stig, and Aaron formed Tellico after recording four records with the Asheville-based bluegrass band Dehlia Low, whose final album Ravens and Crows was released on the Rebel Records label in 2011. “I love how the songs on Relics and Roses sound with these musicians covering all details that I didn’t even realize I was longing to hear. The band’s rich playing overlays absolutely perfectly with the meanings of the songs, whether playful and amusing or searching, haunting and lonely,” says Hinkle. 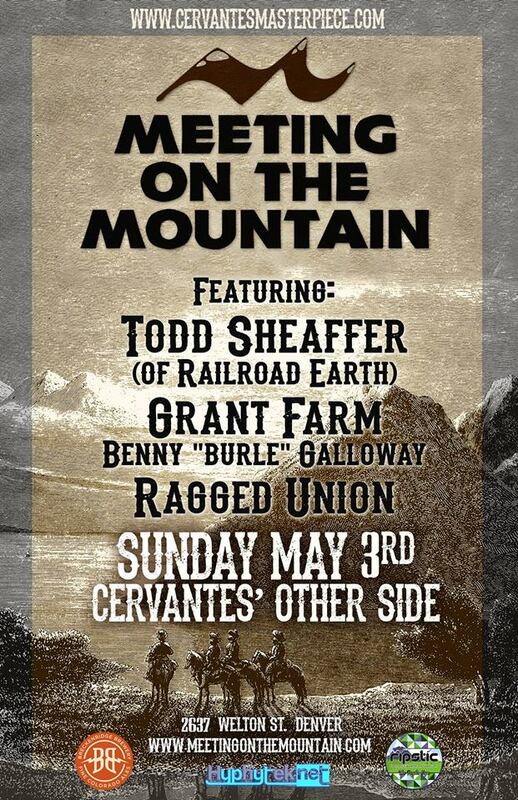 Denver, CO — Meeting on the Mountain, a new collaborative live broadcast experience, kicks off their second event on Sunday, May 3rd, 2015 at 7pm at Cervantes’ Other Side in Denver, CO. Todd Scheaffer of Railroad Earth, Ragged Union, and Benny “Burle” Galloway will be joining in on the fun with host band, The Grant Farm, for this second Meeting on the Mountain experience, with Tyler Grant hosting. The rousing live one-hour broadcast includes performances as well as interviews with each act and gives The Grant Farm the opportunity to collaborate with some of their favorite musicians. Meeting on The Mountain is thrilled to have partnered with Breckenridge Brewery of Colorado and Ripstic Vaporizers for the season. Look out for news and fun contests from them leading up to the next Meeting on the Mountain. There will be five installments of MOTM in 2015 featuring a variety of artists. Each event is hosted by Tyler Grant with The Grant Farm as the house band. It will be recorded, video-streamed live, and rebroadcast at meetingonthemountain.com. The broadcast is followed by a concert with sets from each band. Meeting on the Mountain is filmed and broadcast by Fort Collins-based Hyphytek. The complete deluxe edition re-broadcast of the Inaugural Meeting on the Mountain (3/1/15), along with bonus footage from the night, is now available to view online at meetingonthemountain.com. It features interviews and performances with Jilian and Bill Nershi, Dead Winter Carpenters, Benny “Burle” Galloway and The Grant Farm with host Tyler Grant. The Meeting on the Mountain concept was inspired by a collaborative 4-song EP, entitled Meeting on the Mountain (Sept 2014), which features music by The Grant Farm with Fruition. The song, “Meet me on the Mountain” (written by Fruition’s Jay Cobb Anderson and Tyler Grant) conjures a laid back campfire sing-a-long vibe which embodies the spirit of the new Meeting on the Mountain series and is also the theme song for it. Todd Shaeffer’s life story…is still being written… For now you know him as the erstwhile front man / singer of amazing roots grass band Railroad Earth and may remember that he also was the frontman and key member of From Good Homes. These labels do not define him however, they are only mere reference points for an artist / singer / songwriter who continually creates his best work every day! Ragged Union is a six-piece, hard-driving bluegrass band, performing original tunes and off-the-beaten-path standards, with a focus on the duet singing of husband-and-wife pair Geoff and Christina Union. Award-winning instrumental work, a powerful rhythmic drive, uptempo arrangements and edgy, outsider songwriting are the marks of their style. Influences include Red Allen, Danny Paisley, John Hartford, Danny Barnes, Alan Munde, Jesse McReynolds, and Vassar Clements, with a side of Texas and a healthy dose of the blues. Along with Geoff and Christina, Ragged Unicon includes Chris Elliot on banjo, Jordan Ramsey on mandolin & vocals, Pat Hoeper on fiddle & vocals, and Andrew Bonnis on upright bass. The host band, Grant Farm is a band on a mission. Lead by National Flatpicking Guitar Champion Tyler Grant (Emmitt/Nershi Band), the talented four-piece is built on the foundation of love, family and the joy of music. The permanent lineup of Grant Farm is Tyler “The Champ” Grant on electric guitar and vocals, uber-talented Adrian “ACE” Engfer on bass and vocals, rock solid Sean “Magic” Macaulay on drums and the phenomenally prodigious Kevin McHugh on keyboards. Benny “Burle” Galloway, resident colorado songwriting collaborator and musician who’s first experience at Telluride Bluegrass Festival in 1978 set off his embracement of what true American music stood for. Having moved to Denver in his teens with a guitar and a stack of records, Galloway found the area teemed with progressive sounds, plenty of like minded people to play music with, an abundance of music friendly events, and places to pick and sing. After hearing Hot Rize, John Hartford, Norman Blake, New Grass Revival and Leon Russell, it was evident to “Burle” that he had just found a deep well from which to draw new musical ideas and directions. Burle absorbed every sound available from rock to gospel and began crafting his powerful songwriting skills. In the past decade, Burle has collaborated and played with the finest of musicians and bands in America. His longtime producer and friend Sally Van Meter, Scott Law, Nick Forster, Jerry Douglas, Yonder Mountain String Band, Danny Barnes, Larry and Jenny Keel, Darol Anger, Sam Grisman, John and Rebecca Frazier, Rob Wasserman, Shawn Camp, Jon Wiesberger, Travis Book, Mark Epstein, Robin Davis, Jon Stickley, Tyler Grant Jordan Ramsey, Pete Kartsounes, The Infamous Stringdusters, Leftover Salmon, Great American Taxi, Emmitt Nershi Band, Head for the Hills, The Grant Farm, Broke Mountain, The Wayword Sons, Town Mountain, Espresso, and many more! For more information about the new Meeting on the Mountain LIVE broadcast series, please visit www.meetingonthemountain.com, www.cervantesmasterpiece.com, and www.grantfarm.net. You can also stay up to date on news on the new Meeting on the Mountain social media feeds twitter.com/MOTMLive and facebook.com/meetingonthemountain. 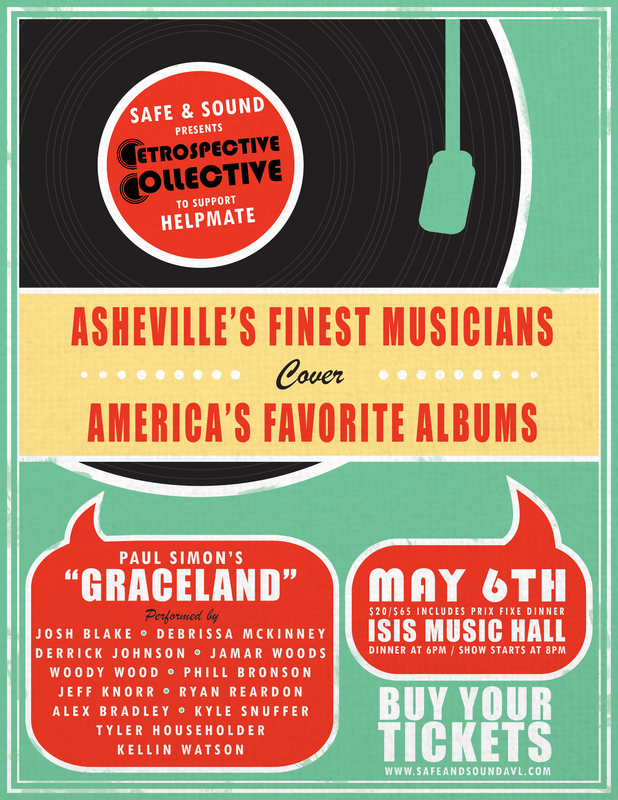 More than fifteen Asheville musicians will gather in a collaborative effort to support local non-profit Helpmate at Isis Music Hall on Friday, May 6th. Orchestrated by local musician, producer, and IamAVL.com co-founder Josh Blake, Safe and Sound Presents: Retrospective Collective will include a very special Prix Fixe dinner prepared by Chef Mike Mahoney and will include instrumental music during dinner and Paul Simon’s album Graceland played in its entirety. 8pm Local musicians perform Paul Simon’s Album “Graceland” in its entirety. $65/ Includes Prix Fixe Dinner by Isis Restaurant and Show and VIP seating. A three course meal prepared by Chef Mike Mahoney and special VIP seating for this very special Asheville show. $500 to sponsor a table of 6 – includes a drink upon arrival and your business name featured at the event. Very special seating for six sponsored by your business. Be greeted with a complimentary cocktail, beer or wine. Then enjoy a three course meal prepared by Chef Mike Mahoney. This purchase is a tax deductible donation to Helpmate. Proceeds to benefit Helpmate, Buncombe County’s non-profit agency providing safety, shelter and support for victims of domestic violence. How to Talk to Rockstars’ cover artwork is by Joshua Spiceland, the design is by Susan Yost. Alli has written for the Mountain Xpress, an altweekly in Asheville, NC, since 2001 and has filled the role of the Arts & Entertainment editor since 2013. How to Talk to Rockstars is based in part on her 14-or-so years spent interviewing artists of all genres, but especially touring musicians. The novel — think Almost Famous meets The History of Love — follows wallflower-turned-journalist Bryn Thompson. She has a dream job: she interviews rock stars. Bryn’s professionalism keeps her on track, but also emotionally removed from the gritty world of backstage, bars and drugs that she writes about. That is, until she meets musician Jude Archer, whose songs haunt her. As an unlikely friendship grows out of Bryn’s obsession with Jude’s album, Bryn begins to rethink all of the carefully-contrived rules that until now have helped her maintain a professional distance. 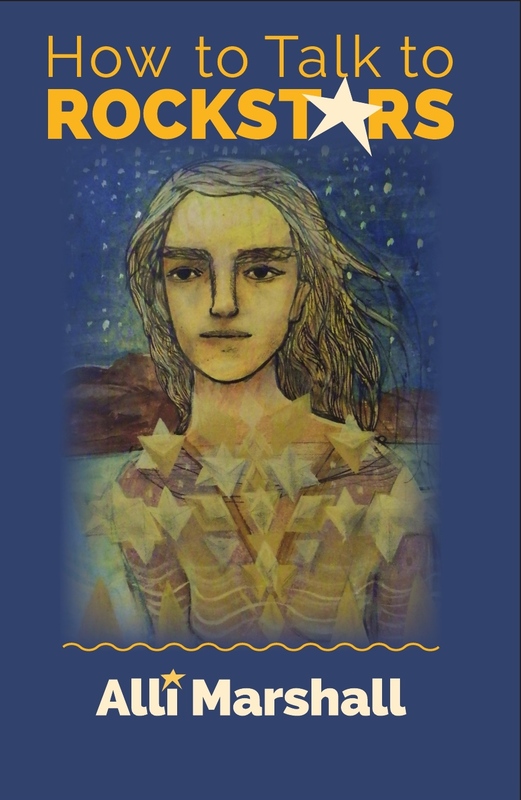 The launch party for How to Talk to Rockstars takes place at Malaprop’s Bookstore/Cafe, 55 Haywood St., Asheville, N.C., on Friday, May 15. Festivities begin at 7pm with treats, a reading, a Q&A session, and live music by singer-songwriter Vickie Burrick of Warm the Bell. The event is free and open to the public. Writing a novel takes time, time, time, patience, determination and at least a little bit of insanity. It takes months — possibly years — of missed parties, late nights and early mornings. It takes many hours in front of a computer screen, and a stronger eyeglasses prescription. Now that How to Talk to Rockstars exists on the page, it’s time to get it into bookstores and (more importantly) into the hands of readers. This takes money, so Alli launched an Indiegogo Campaign. The funds raised will go to a creatively sourced publicity campaign including print media, radio, blogs, podcasts and TV. The other part of the publicity campaign is author events such as readings and further book signings, talks, appearances at book clubs and festivals (both literary and music-oriented), as well as libraries, schools, and heck, maybe street corners! Alli Marshall grew up in Western New York and has called the mountains of North Carolina home for more than 20 years. She’s a Warren Wilson College graduate and completed her MFA in creative writing at Goddard College. 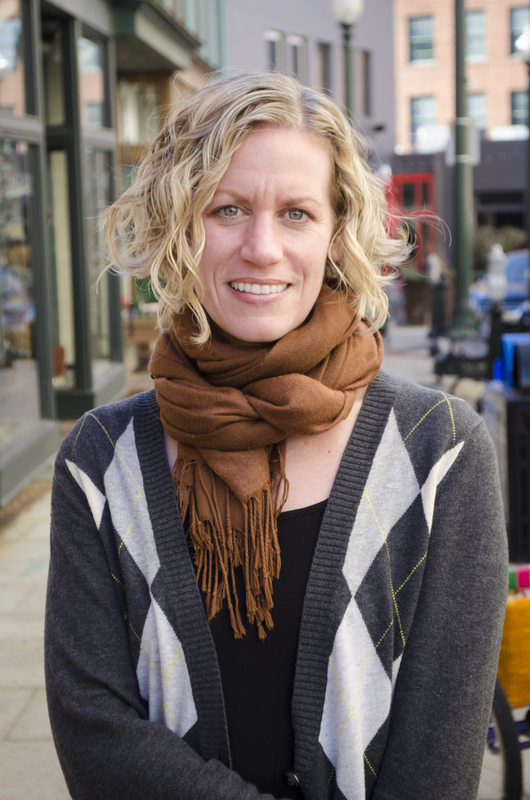 She’s been named the best arts reporter in Western North Carolina in the annual Best of WNC reader’s poll, 2011-2014. She received awards in editorial reporting from the North Carolina Press Association in 2005 and 2014, and from the International Festivals & Events Association in 2004. She also took home top honors in the Cupcakes for the Cure bake-off (local ingredient category) — but that’s another story. And though Alli doesn’t like to brag or anything, over the course of her career she’s interviewed Yoko Ono, Cyndi Lauper, Chris Robinson (The Black Crowes), Aimee Mann, Dan Auerbach (The Black Keys), Britt Daniel (Spoon), Michael Franti, Neko Case, Daniel Lanois, Ziggy Marley, Peter Murphy, Grace Potter, Jamie Lidell, Kishi Bashi and many, many others. For more information, please visit: www.alli-marshall.com and http://www.logosophiabooks.com. Stay up-to-date with news from Alli at www.facebook.com/allimarshallauthor, www.twitter.com/alli_marshall and www.instagram.com/alli_marshall. Read more of her feature articles at www.mountainx.com/author/amarshall.